(CNN) -- Summer is over in the northern hemisphere, but it's been another chilling season for researchers who study Arctic sea ice. Disappearance of Arctic ice cover may affect storm systems, storm tracks and crops, according to researchers. "It's definitely a bad report. We did pick up little bit from last year, but this is over 30 percent below what used to be normal," said Walt Meier, a research scientist with the National Snow and Ice Data Center in Boulder, Colorado. This past summer, the Arctic sea ice dwindled to its second lowest level. Arctic sea ice is usually 1 to 3 meters, or as much as 9 feet thick. It grows during autumn and winter and shrinks in the spring and summer. Scientists have monitored sea ice conditions for about 50 years with the help of satellites. Changes in the past decade have been alarming to climate researchers and oceanographers. "It is the second lowest on record. ... If anything, it is reinforcing the long-term trend. We are still losing the ice cover at a rate of 10 percent per decade now, and that is quite an increase from five years ago," Meier said. "We are still heading toward an ice cover that is going to melt completely in the summertime in the Arctic." Although few humans live in the Arctic, the disappearance of this ice cover can have effects far beyond the few residents and the wildlife of this harsh region. Ice cover loss can influence winds and precipitation on other continents, possibly leading to less rain in the western United States and creating more in Europe. "That warming is going to spread to the lower latitudes, to the United States, and it's going to affect storm systems and storm tracks, the jet stream; that's going to affect crops and all sorts of things," Meier predicted. So, just how much ice is disappearing? "Seven million square kilometers roughly corresponds to an area of the lower 48 United States. 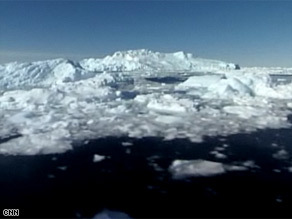 So back in the early 1980s, the lower 48 states would be covered in sea ice in the summer," Meier said. "Now we've essentially lost sea ice east of the Mississippi River and even beyond. So that's a significant amount of area." "The Arctic sea ice melt is a disaster for the polar bears," according to Kassie Siegel, staff attorney for the Center for Biological Diversity. "They are dependent on the Arctic sea ice for all of their essential behaviors, and as the ice melts and global warming transforms the Arctic, polar bears are starving, drowning, even resorting to cannibalism because they don't have access to their usual food sources." CNN's award-winning series returns with a worldwide investigation into the environmental conflicts between growing populations and natural resources. Hosted by CNN's Anderson Cooper, Dr. Sanjay Gupta and National Geographic host Lisa Ling. In May, the U.S. Department of Interior listed the polar bear as a "threatened" species under the Endangered Species Act. In a news release, U.S. Interior Secretary Dirk Kempthorne stated, "loss of sea ice threatens and will likely continue to threaten polar bear habitat. This loss of habitat puts polar bears at risk of becoming endangered in the foreseeable future, the standard established by the ESA for designating a threatened species." "The Arctic is kind of the early warning system of the climate," Meier said. "It is the canary in the coal mine, and the canary is definitely in trouble."